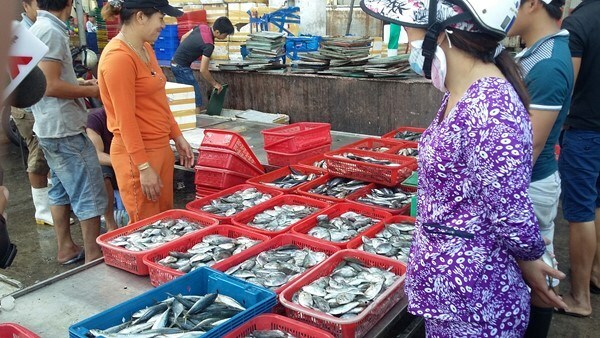 Da Nang (VNA) – The central city of Da Nang and other affected provinces have launched points of sale for clean fish in the wake of the mass fish deaths that occurred in the central coastal region in early April. After several fish were found dead ashore in Da Nang on April 26, the municipal Department of Natural Resources and Environment announced the test results of sea water samples two days later, saying that all measurements are within allowed limits and the sea is thus safe for swimming and aquatic sports. The city’s leaders and officials also went for a swim in the sea to counter pollution rumours. On April 29, the municipal Department of Agriculture and Rural Development convened a dialogue to seek ways to clear obstacles for fishermen and merchants. Nguyen Phu Ban, Director of the municipal department, said his agency is tracing the origin of seafood on sale. From May 2, any fishing vessels must have diaries recording which fishing grounds they worked on. After coming back to port, all catches will be checked for quality. In the central province of Thua Thien-Hue, over 200 tonnes of sea fish were purchased by the provincial authorities over May 1-2. To shore up public trust, the provincial authorities also granted over 30 certificates to fishermen who catch fish in safe waters. Clean fish have been put on sale in more markets and shopping malls across the province. In the past two days, more than 160 tonnes of sea fish were also bought by merchants in the central province of Quang Binh.